Here’s our model shooter doin’ the Bernie. Or facing a hurricane–we’re not sure which. The ’80s movie Weekend at Bernie’s was a pop icon film that exemplified heart-wrenching and soulful acting, panoramic cinematography, and helpful tips on how to party with a dead guy. Why it was shunned from Academy Award consideration remains a mystery, although industry insiders have long suspected a voter fraud scheme by Morgan Freeman and the producers of Driving Miss Daisy . Weekend at Bernie’s is not only a golden example of the silver screen art form, it demonstrates dozens of important practical life tips. For example, if you ever find yourself dead as a result of forced heroin overdose by Mafia hit men, you can still party for days on end simply by wearing sunglasses. You can also inspire short-lived fads like popular YouTube dances. In this case, it’s called the “Bernie,” or in some circles, “moving like Bernie.” If you watch someone doin’ the Bernie , you’ll notice the essence of the dance is a severe and painful backwards lean. Which brings us to this weeks installment of the Seven Deadly Sins of Handgun Shooting: doin’ the Bernie. We’ve all seen it, and most of us have done it. Men, women, kids, competitive Steel Challenge Llamas. It doesn’t matter. Doin’ the Bernie is a universal new shooter offense. What exactly is doin’ the Bernie? It simply refers to leaning backwards from the waist, so your shoulders are behind your belt line. Your head also leans back, like you’re trying to stop a nose bleed. It looks like you’re trying to shoot into a Category 5 Hurricane headwind. Why do perfectly respectable people do the Bernie? Perhaps they’re afraid that the gun will turn around and start chasing them. Or maybe it’s a subconscious move to show other nearby shooters just how relaxed they are shooting this huge, powerful pistol. Sort of gansta in a way. More likely it’s an instinctive protective reaction to get as far away as possible from the big explosion about to happen in front of their face. Whatever the reason, doin’ the Bernie really hurts your ability to shoot well. First of all, you’ve given the gun a huge head start in the battle against recoil. If you’re already about to fall over backwards, it doesn’t take much more of a push to send you off balance. That gun is going to shove you around and make you its bit…never mind that, let’s move on. Second, the general weakness of this stance increases the odds that your gun will malfunction. If you’re shooting a semiautomatic handgun, that gun requires forward force in order to cycle correctly. If you’re not pushing forward against the gun with enough force, it won’t cycle correctly and is likely to jam. If this happens at the range, you’re only embarrassed. If it happens in a real-life self-defense situation, the consequences are far worse. Third, it just looks kind of ridiculous. And isn’t that the most important thing? If you don’t know if you do the Bernie, just munch on some Brown Sugar and Cinnamon Pop Tarts while you shoot. If the crumbs fall on your belly, then you might be doin’ the Bernie. So how do you shoot without doin’ the Bernie? Now here’s a handgun stance. Shoulders are just in front of the belt. Knees flexed. She’s controlling that gun, not the other way around. Well, that where things get confusing. You see, there are a few commonly taught handgun shooting stances. The Weaver Stance: Place your support side foot forward of your shooting side foot. Put your shooting side arm straight out. Use your support hand to pull back on the gun, keeping your elbow bent, to create some isometric tension. The Isosceles Stance: As the Sword of Damocles was made obsolete by guns, the Handgun Stance of Isosceles became cool. Keep both feet parallel to the target, shoulder width apart. Now shove both arms forward to form a triangle. That’s where the “isosceles” part of Isosceles Stance comes from. Clever huh? So which of these is right for you if you’re going to ban the Bernie from your shooting? 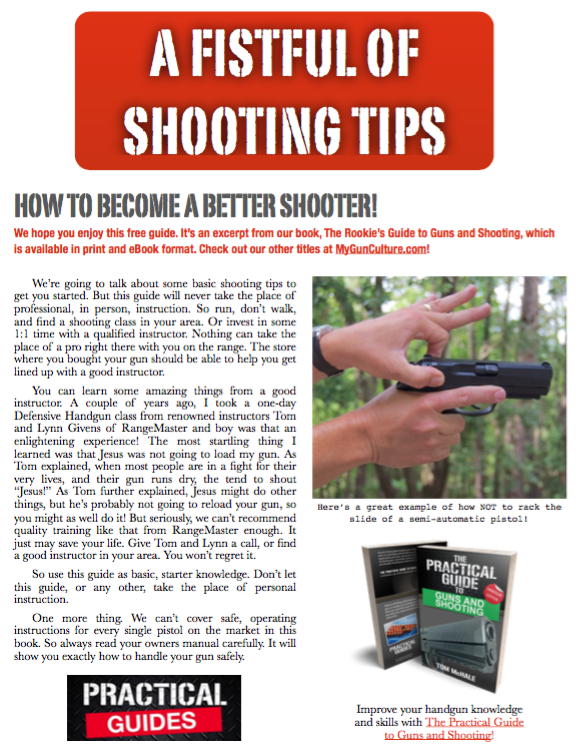 It doesn’t make a darn bit of difference, because you can obtain a proper shooting stance with either of those methods–or some other. You see, when it comes to killing Bernie (yet again) most of the battle is getting your body weight forward. The nuances of arms and feet positions are secondary to that. Getting proper weight balance is pretty simple. If you like to put your weak side foot a little forward, great, do that. If you prefer to keep your feet side by side, great, do that. Flex your knees a bit. That makes the next step easier and gives you a better shock-absorbing platform. It also facilitates movement. Crazy things those knees! Here’s the important part. Bend a little forward at the waist. Your collarbone should be in front of your belt buckle. If you’re not wearing a belt, pretend you are. Roll your shoulders inward and down just a touch. That’ll help control recoil even more. Assume your Weaver, Isosceles, or Iron Lotus position. It doesn’t matter. Make sure those shoulders stay in front of your waist. You’ll be amazed at how little your handgun recoils when you get your weight forward of your belt. You’ll make that gun your bit…never mind. Let’s just say you will be controlling your handgun–not the other way around.